Are you a whiz when it comes to electronic devices? Do you love to experiment with different type of gadgets, see how they work and put them back together? In this era of technological innovations, electronic gadgets hold a very important role in our lives. They have made doing the daily tasks simple and easy. They have completely transformed the way we lead our lives. 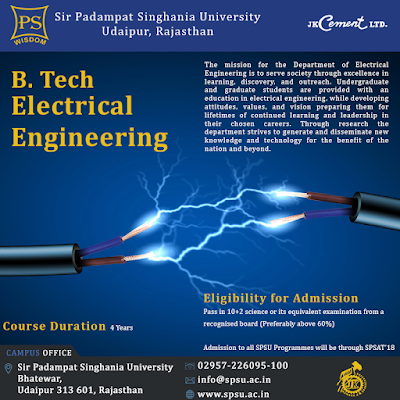 Those who are interested in such field can pursue electrical engineering as a career. Electrical engineering involves the understanding of application of electricity, electronics and electromagnetism. It helps a student understand the complex designs and the things required to build them from the scratch. It is important for a student to have the ability to look at the bigger picture and carve a beautiful career for them. There are numerous colleges which offer electrical engineering courses. So here is the list of the best electrical engineering colleges in Rajasthan that you can choose from to get top quality education at relatively affordable price. Sir Padampat Singhania University is one of the top-notch engineering universities located at Udaipur in Rajasthan. As there are ample opportunities in both private and public sectors for electrical engineers, the course makes the students competent enough to grab excellent job opportunities. The faculties provide latest syllabus which is designed to meet the needs of the industry. The university and its faculty members impart knowledge of current technology to help the students stay informed of the latest industrial developments. Moreover, the faculty members nurture the students to put ideas into practice through analysis. Jaipur Engineering College, being considered as the best electrical engineering colleges in India by the aspirants due to its excellent infrastructure and quality of education was established in the year 2000 with a goal to provide affordable engineering education to the bright students. It was set up on the peaceful outskirts of Jaipur city to provide the students a peaceful environment for studies. Currently, more than 6000 alumni of JEC Group are working across the globe. They not only provide the students with best education but also ensure that they get the right infrastructure to easily understand the needs of the field. With the best team of faculty members, students can sharpen the skills and get placement with the top companies. Vyas Institute of Engineering and Technology is located in Jodhpur, Rajasthan. It was established in the year 2007 and it is accredited by AICTE. Its campus is spread over 50 acres which consists of facilities such as academic zone, AC laboratory, auditorium, canteen, ATM, computer lab, counselling, gym and a lot more. They have the best faculty members who are experienced and have expertise in the subjects to help the students gain the necessary skills easily. If you want to have a career in Electrical Engineering then these were the top 3 colleges in Rajasthan that you can consider for admission purpose. You can enrol yourself in any of these institutions and give wings to your dreams. You can go to the website of these engineering institutions and check all the details including the campus placement, admission process, overview and much more.